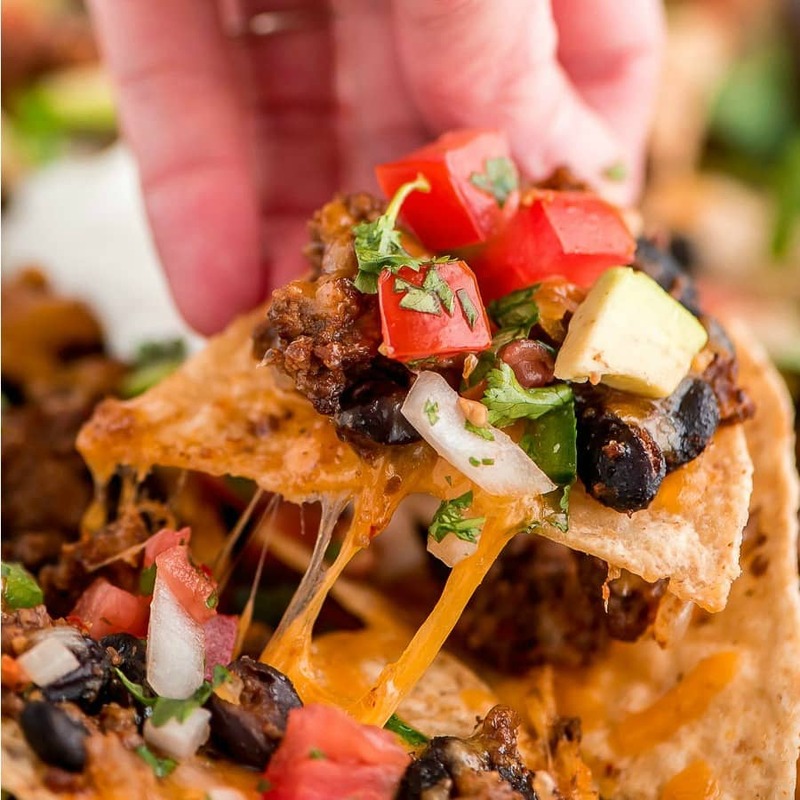 These Loaded Nachos are piled high with chips, beef, beans, cheese, pico de gallo, and avocado. 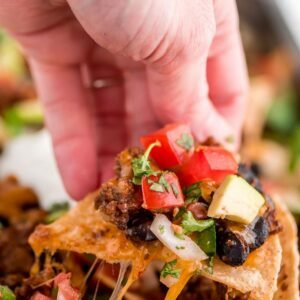 They’re the perfect game day food, are easy to make and are so easy to customize based off of your favorite nacho toppings. 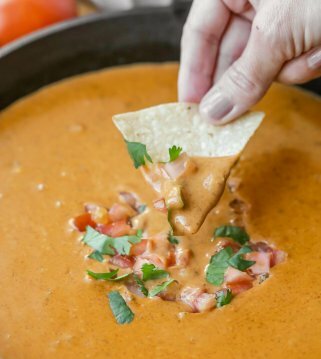 I have a weakness for chips and dip. 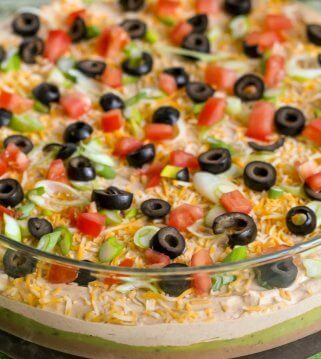 Spinach Dip and Layered Dip and are some of my favorites along with these Loaded Nachos. It doesn’t get much better than meat, carbs, and cheese, am I right?! 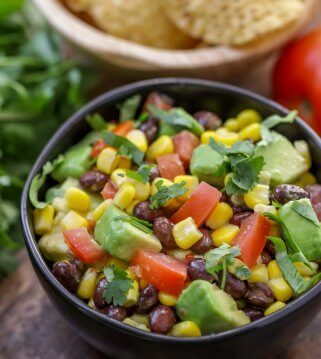 These nachos can count as your meal because they’ve got it all- carbs, proteins, veggies, dairy… I mean they’re pretty much a taco just in a different form. Now, if you’re going to go to the trouble of making all the toppings you might as well make a lot (Go big or go home!) 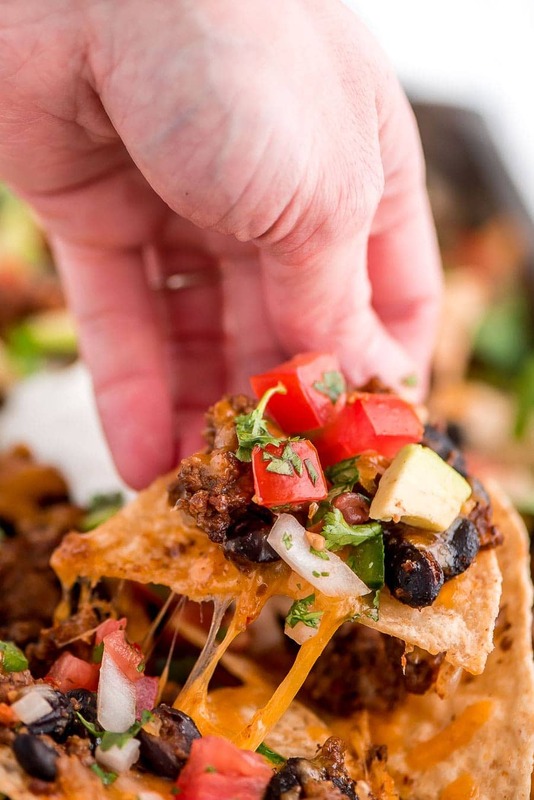 So a whole pan worth of nachos is what you’ll be making with this nacho recipe. To make these Loaded Nachos you first have to get your pico de gallo ready. 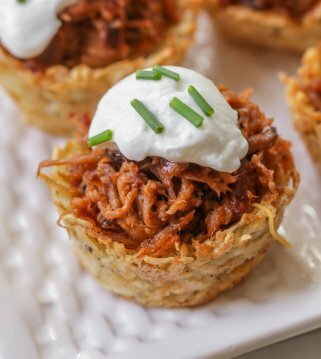 It’s super easy to make and tastes amazing. All it takes is a few tomatoes, onions, jalapeno (more if you like things hot! ), lime juice, and cilantro. Mix it all together and let it sit for a little bit to let the flavors come together. 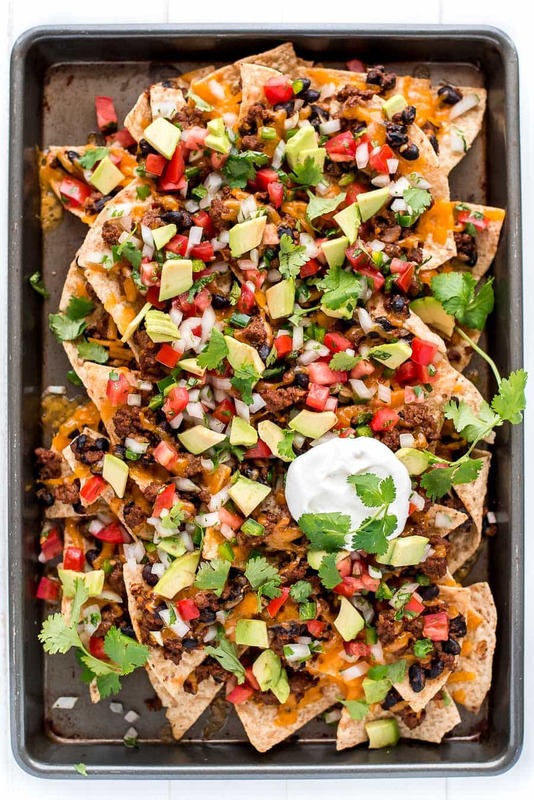 As much as I like the pico, avocados, and sour cream, what makes these nachos is the MEAT (which can be whatever you choose – beef, chicken, pork, etc.) For this recipe we used beef. Brown your beef with some sweet onion in a skillet, drain off the excess fat, add the water and taco seasoning, cover and simmer on low. I like to simmer mine for about 10 minutes so it gets nice and tender. Then I add in the black beans (sometimes with an extra tablespoon of taco seasoning for more spice) and simmer for another 5 minutes so the beans are warmed and tender. As we already mentioned, these nachos can be made to your liking. We feel like the more you add, the better, but we wanted to compile a list of some of the best nacho toppings for you to pick and choose from. Once you have all the parts for your nachos ready to go you can assemble them. 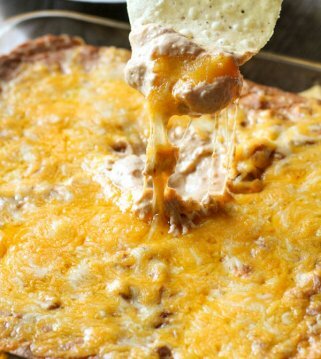 This pan of nachos doesn’t have just one layer of chips but TWO! Yep, top your chips with the meat mix and cheese, and REPEAT! Pop it in the oven for a few minutes until the cheese melts and then add the topping and dig in! Enjoy! 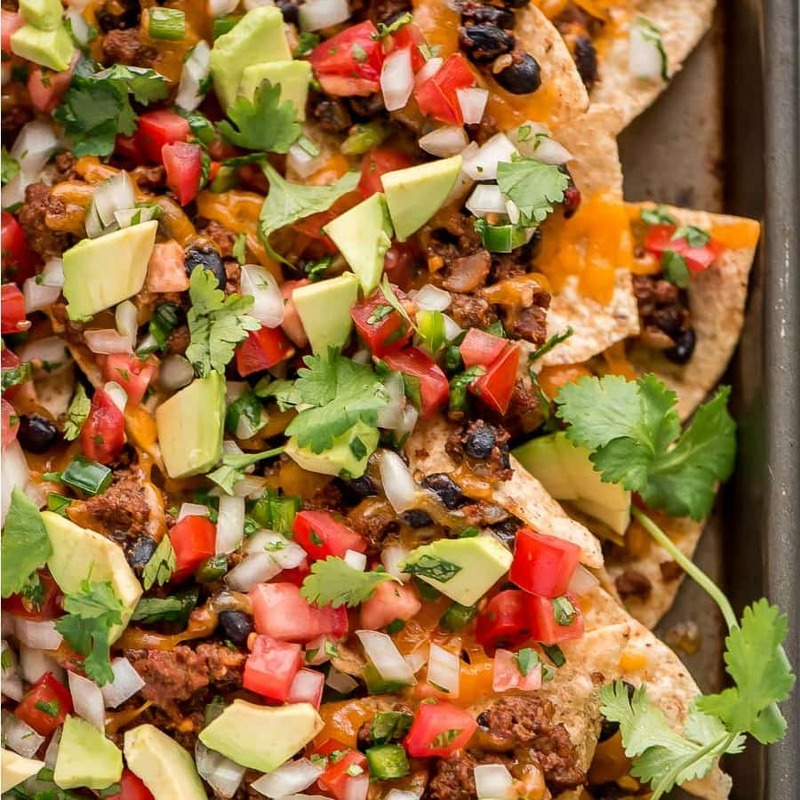 These Loaded Nachos Are Piled High With Chips, Beef, Beans, Cheese, Pico De Gallo, And Avocado. 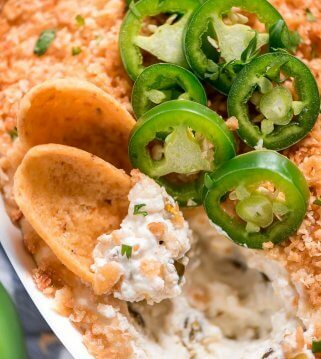 They're The Perfect Game Day Food, Are Easy To Make And Are So Easy To Customize Based Off Of Your Favorite Nacho Toppings. Make the pico de gallo by mixing together 1/2 of the chopped onion, 3 Roma tomatoes, jalapeno, cilantro, lime juice, and salt. Set aside. Add the beef and other half onion in a non-stick skillet over medium-high heat until no longer pink and onions are translucent. Drain off the fat, and mix in the water and taco seasoning. Bring to a simmer, cover and turn down to low. Simmer for 8-10 minutes until tender. Stir in the black beans (add another 1/4 cup water if too thick) and simmer another 4-5 minutes. Meanwhile, line a large rimmed baking sheet with a layer of chips. Spoon half the meat/bean mixture over the chips followed by half the cheese. Add a second layer of chips and repeat with meat mixture and cheese. Place in the oven for 3-5 minutes until cheese is melted. Top with pico de gallo, avocados, extra cilantro, and sour cream. Serve immediately. LOL!! You will just have to make them! Thank you!